Announcing Ardor (Nxt 2.0), the successor to the pioneering Nxt platform, which has been an inspiration for many other successful blockchain projects. Ardor builds on the experience we have gained from running Nxt 1.0 in production for over two and a half years, and aims to solve real world problems of scalability, privacy, currency liquidity and usability. Ardor retains all the core features of the first version of the Nxt Blockchain, but builds and expands on Nxt 1.0 by adding secure and scalable child chains. This new flexible architecture allows users to create their own blockchains, customised to fit their needs, while drawing security from the collective ecosystem of the global Ardor platform. Ardor is being built by a very experienced and professional developer team. The same team that built the first true Proof of Stake system, that implemented the first decentralised token trading system, the first and only fully decentralised coin shuffling implementation among many other groundbreaking features for cyryprocurrency/blockchain. The Nxt core team has been consistently innovative since the original Nxt launch back in 2013, and many Nxt innovations have been incorporated into other projects. The initial research phase of Ardor has passed. Pooling their experience of working on Nxt 1.0 for over two years, Core devs Jean-Luc, Riker, ScripterRon and Petko have already started the first phase of coding for Ardor. Coding Ardor will take time. The Core Team does not want to launch an overhyped and half-finished system, but wants to make sure the new platform holds up to the high standards you have come to expect from Nxt 1.0. We consider this to be the de-facto reference standard of stability and performance that a blockchain platform should adhere to. At the time of writing, the Core Team aims to launch the first version of the Ardor Testnet very early in 2017. During the Testnet phase of the software, there will be many rewrites and tweaks based on user feedback and continuous use of the platform. The Testnet phase will last for at least six months to make absolutely sure the first live version will be safe and trustworthy at launch. At the time of writing, it is estimated that the first live version of Ardor will launch in Q3 of 2017. Ardor will retain ALL Features of the Nxt 1.0 platform. Account numbers are preserved. Since the mapping from secret phrase, to public key, to account id will not change, your 1.0 pass phrase will correspond to the account with the exact same number on Ardor. Existing 1.0 users will be able to login to Ardor with their existing passphrase. The Account table will be global, and each account can have balances in any of the Child Chain tokens, as well as in Ardor. This is probably best done by burning existing Assets, requiring them to be sent to the issuer account in order to issue new Nxt 2.0 Assets in exchange. Or it could be done by each asset issuer declaring a height at which they will take a snapshot of 1.0 asset balances, and then re-distributing those on Ardor. Assets will be universal on Ardor, which means that for any Asset, regardless on which Child Chain it was originally issued, any Child Chain that will allow its trade will be able to trade it. Open or finished Polls will NOT be ported to the Ardor chain. Running polls will need to finish on the Nxt 1.0 chain. Ardor will support Plugins, but existing Plugins will need fixes to work with the new Ardor platform. It will not be necessary to burn your 1.0 coins to receive Ardor tokens, and you are free to trade your Ardor Tokens which you will receive after the snapshot period has ended. The Core Team wants to make migrations to Ardor as easy as possible, so is allowing a wide window for making this move. The Core Team will also provide help and support for users that wish to move their enterprises from Nxt 1.0 to Ardor. Ardor’s prime innovation is to split the blockchain into a main chain that is used for consensus creation only, and multiple child chains that keep separate ledgers of transactions, each child chain using its own coin/token.. This means that there will initially be two distributions of tokens: one for the main chain token (Ardor), and one for the token for the first child chain to be launched (for now called FNX). The Core Developers recognise the tremendous contributions of the investors and holders of the original Nxt 1.0, without whom Ardor would not be possible, and have decided to grant them exclusive rights to these new tokens. It is important to note that Ardor does not mean Nxt 1.0 will cease to exist! The Core Team is committed to continue providing support to Nxt 1.0 for at least one year after the Ardor launch, and possibly further. There will be no burning of Nxt 1.0 needed in order to receive either Ardor or FNX Tokens. All NXT holders are eligible to receive Ardor Tokens at launch of the Mainnet. Shortly after the release of Nxt 1.9, (intended to be the last major release on the Nxt 1.0 branch) the Nxt Software will start taking periodic snapshots of all users' NXT balances, at regular intervals (most likely once an hour), for a period of three months. The NXT balances in each account will be averaged over this full three month period, and at the end all accounts will be automatically credited with a token representing their Ardor holdings, issued as an Asset on the Nxt asset exchange. This Ardor Asset will be freely tradeable. The distribution of the real Ardor coins (to be done at the launch of the Ardor Mainnet in Q3 2017) will be based on the ownership of Ardor Assets on the 1.9 blockchain, taken at the point of time when the Ardor Genesis block is created, shortly before that launch. The distribution of the FNX Token will be based on each account’s NXT holdings at the time of the Ardor Genesis block creation. At the time of writing, the Core Devs have decided to credit 50% of these holdings to each new FNX Account, while reserving 50% of FNX for funding of the development team, business development and other operations that will need funding to make the Ardor project a success. Professional, solid, informative and great to see development updates for the future of Nxt! We keep creating good and solid software which is needed to gain traction in the blockchain world. Amazing!!! Why is this difference? Internally both MS and Assets are the same thing. Why have you decided to not port assets? Do I understand it right that multisig accounts are no longer multisig on the FNX chain? they decided to opt for the allocation of 50% for project development and sustainability. Well it's 50% dilution but I can live with it. Use and share if you like! And it's good to read that development funds will be secured. I remember I did suggest somewhere to do a 50% split in the main chain token, but preserving a 1:1 distribution on the main chain and reserving from the transactional token is a better solution. 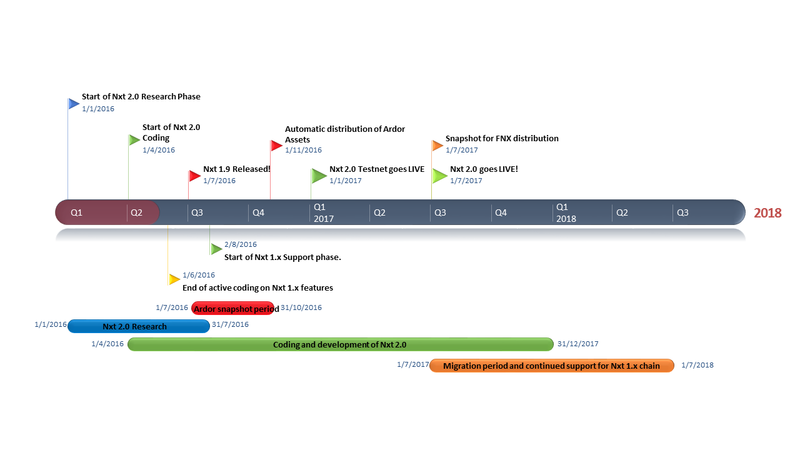 Great roadmap, it's going to be a bumpy ride until then, but when you see what NXT has delivered in the past this release will be epic. Can we maintain an auditable use of FNX coins to boost confidence? I believe transparency pairs with financial compensation in a good way, please keep this in mind. At this price it's a cheap IPO when you compare to the lisk IPO prices ! Thanks a lot for the detailed roadmap! I firmly believe Nxt has a good chance of competing in the whitelabel blockchain market after reading both threads, the proposal sounds absolutely achievable. It also sounds like multi-sig accounts won't be possible at all on the FXT chain. Well done, hope it wil get a lot of attention. Looks like a great solution with a lot of potential. Phasing will be possible on the child chains. Perhaps Jean Luc can lean in on this. Awesome!!! A lot of excitement!! Yes, but it sounds like the settings won't be ported, so a NXT 1.0 multi-sig account will become a single-sig FNX account, until its owner sets it up as multi-sig again. This means the other signatories have to trust the owner to actually do that. I don't know if this is a real issue or just an academic one, but it does sound like a loophole in multi-sig security. Don't we need climate friendly on the announcement? Can I just say how much I hate the names "FXT" and "FNX"? I find it very hard to remember which is which. Is there a trick to it? Do the letters mean something? No meaning is attached to them other than to distinguish between tokens for now. Personally, I am still all for a rebrand at 2.0. Thanks coreteam and Tennessee for this great update! Right on with the roadmap! Thnx coreteam and nxt foundation! Couldn't choose a better moment! Great roadmap and looking forward! Keep up the good work!